So there are two issues here, and I will address them separately. The first issue is that someone made this video with the sole purpose of offending and shaming, and not with the purpose of starting a conversation. Look, whoever made this video: I understand that you found this class ridiculous and offensive. But mocking and offending people who think differently from you is not a mature or productive way of critiquing their ideas. Only cowards use shaming and ridicule to prove a point. All you are doing is making yourself look like a jerk. Not automatically assuming that you are superior to the person you are criticizing. Because you aren’t. And even if you were, being condescending only reflects badly on you and makes everyone less likely to respect you. Being genuinely open to hearing the other side. Start from the assumption that they have something valuable to say. Be curious. You might learn something. Criticizing the idea, not the person or people who stand behind it. I came across a video of a rabbi teaching a class about a passage in the Talmud that discusses women’s bodies in a way I found very offensive. It disturbs me very much to think that the religion you practice is based on texts that discuss women’s bodies this way. Assuming, based on what I know of you, that you are a person who respects women, I wonder how you can reconcile your respect for women with the ideas discussed in this text. I discussed my thoughts on Torah passages that I find hard to swallow in my post, “Women in Orthodox Judaism, or: Daniella Opens a Can.” The thing is, there I was discussing texts that we believe come straight from God. When we’re talking about rabbinic teachings, the belief that “God knew what He was doing, even if I don’t understand, and maybe part of the purpose was to make me question and struggle with this” doesn’t apply that well. One can argue that God gave the authority to the Sages to make rulings (Deuteronomy 17:8-13) and therefore whatever they say is basically the same as what He said, but the distinction between Torah law (d’orayta in Aramaic) and rabbinic law (d’rabbanan) is one that is recognized in halakha. While we do see following mitzvot d’rabbanan in general as being a mitzvah d’orayta, there is more wiggle room within their application. One of the important principles of halakha is “safek d’orayta l’ḥumra, safek d’rabbanan l’kula“–when there is a question or uncertainty in halakha, if the matter concerns a Torah law, the tendency is to take the more stringent view, whereas our tendency in the case of a rabbinic law is to be more lenient. Anyway. There are a few things I think it’s important to take into account when approaching problematic passages like the one mentioned in the video. These passages were written hundreds and hundreds of years ago. Respect for women was not at its pinnacle in that day. You have to understand that up until extremely recently, marriage was primarily a financial transaction. The Jewish institution of marriage was progressive for its time in that it acknowledged women as being more than just property, granting them certain rights. But it wasn’t what we think of as the ideal, egalitarian marriages today. In most cases, the bride and groom were not friends or acquaintances before they were betrothed. In many cases they only saw each other briefly before the wedding. For their purposes, this passage in the Talmud discusses a financial transaction under false pretenses. Being physically healthy/not deformed was important information in that context, and hiding a deformity was considered dishonest conduct. The discussion here is to draw the perimeters around what qualifies as a deformity so that a man wouldn’t just randomly decide that he doesn’t like how his wife looks and claim that she is deformed so he could divorce her without giving her compensation. This doesn’t make it okay. It doesn’t mean the passage isn’t sexist and objectifying. It is. It just means that you can start from the assumption that they were doing the best they could with what they had at the time. Shakespeare’s The Merchant of Venice is rife with antisemitic tropes. Shakespeare had most likely never met a Jew in his life; he was reflecting an idea within his society of what Jews were. He even made the character of Shylock somewhat complex with his “If you prick us, do we not bleed?” That doesn’t make it okay and it doesn’t make the play less antisemitic. But it makes me more understanding and forgiving of Shakespeare for doing the best he could with what he had. Remember how I mentioned that the word “Talmudic” has two definitions in the English dictionary–one being “of or relating to the Talmud” and the other being “characterized by or making extremely fine distinctions; overly detailed or subtle; hairsplitting”? If the Sages are arguing over exactly how many degrees below the horizon (and from which vantage point, and from what elevation!) the sun must be to count as “sunset” … why shouldn’t they be arguing over what might be considered a deformity at the same level of detail? No topic is off-limits for discussion in halakha. The major issue we have with this passage is that it’s an intimate discussion of a woman’s body in a way that is objectifying. But the Talmud is full of dispassionate discussions of various parts and functions of human anatomy and physiology–male and female–because halakha permeates absolutely every aspect of life and every detail is important. Moreover, sometimes the Talmud brings ridiculous and extreme examples that no one in their right minds would actually believe could happen. Sometimes this is a rhetorical device by which the Sages sort of “frame the perimeters” of a halakha. Sometimes it’s there to make a different point altogether, or address another kind of situation in a roundabout way. I highly doubt that anyone ever in the history of Judaism walked up to a rabbinic judge and held a ruler up to his wife’s chest to get out of paying her for a divorce, and I doubt that the rabbis who sat around debating this actually thought they’d ever see such a thing happen. Jewish law did not start with the Talmud, and it doesn’t end with the Talmud either. In fact, the compilation of the Talmud itself was a capitulation. 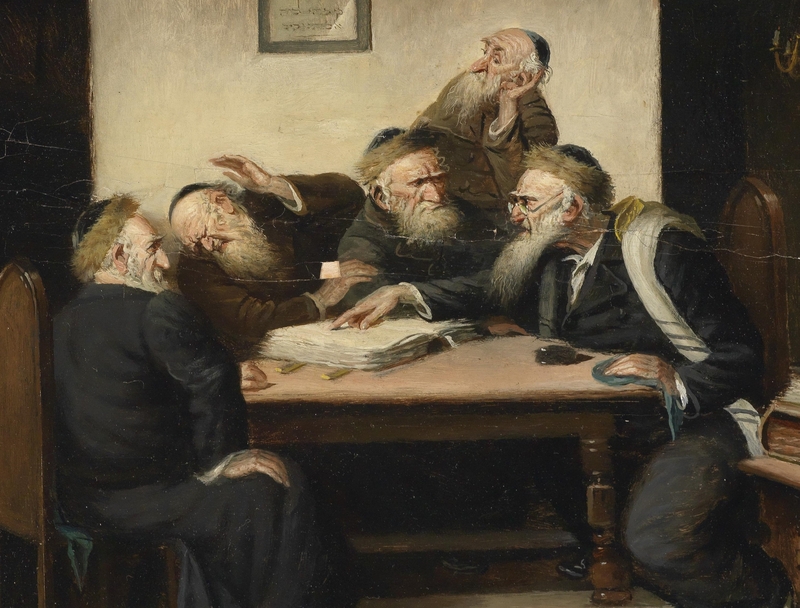 There was originally a prohibition to write down the Oral Torah, precisely because the Oral Law was supposed to be a continuous discussion between teacher and student–not doctrine set in stone. (If you have no idea what I mean by Oral Torah, click here.) The way the modern application of halakha works is that it filters down from the Torah, through the Talmud, then through the rabbinical authorities of each age, right down to the rabbis making halakhic decisions right this very second. The final word in halakha ideally belongs to a living person. Inevitably, there were ideas that came up in the past 2,000 years that didn’t pass the test of time, but are still preserved in our ancient writings. The Talmud also says that a women burning her husband’s food can be grounds for divorce. Obviously, that is not applied today. It is only one of many ideas in the Talmud that are not applicable in modern halakha (according to mainstream Orthodox Judaism). One might ask what value there is in preserving these problematic passages, and why we don’t discard them. Or even if we don’t discard them–why are we still discussing and teaching them, if they are rejected by most halakhic authorities today? It’s a good question, and I think the answer is that we don’t like to get rid of things. 😛 Especially not rabbinic writings, because we see them as having inherent value, even if we find elements of them problematic or offensive today. This passage in general is a discussion about a financial transaction under false pretenses, and there is a lot of important information and ideas in it even if some of them make our stomachs turn. As to whether we should be teaching them, that’s a judgement call on the part of the particular school or teacher. The bottom line is, these kinds of passages make most modern Orthodox Jews uncomfortable too. Some respond to them with apologetics; some just ignore them; and some, like myself, face them, struggle with them, and ultimately accept them as part of an imperfect system that we believe is the best we’ve got. Some, unfortunately, use them as a basis for their own backwards, sexist, racist etc. worldviews. Like anything, it depends a lot more on the person reading than on the text itself. Do you have any questions or thoughts you’d like me to address in a letter to Josep? Feel free to ask in the comments, use the contact form, or just shoot me an e-mail at letterstojosep[at]gmail[dot]com. Thanks Daniella, that was a really thoughtful and helpful response to a difficult question.